OK, I'll say it: I never quite knew what Ten-O-Six did, or if it did anything. I didn't realize that Bonne Bell moved to Australia and cut back on their American product distribution, but that's what Wikipedia says. 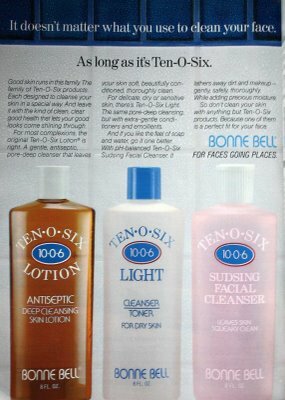 (They also note that Ten-O-Six is a "camphor astringent" and was briefly discontinued in 1998.) And if you Google Ten-O-Six, you'll find lots of people bemoaning the fact that they can't find it any more. But it appears to have been reintroduced and renamed Formula 10.0.6 So Totally Clean, so if you're still in the market for a kinda stingy antiseptic cleanser that shocks you with how much dirt winds up on a cotton ball, and whose smell reminds you of Duran Duran days, keep an eye out for the new name. I was a Sea Breeze girl myself. That stuff was harsh! I was a Sea Breeze girl myself! i was born in 79, so i was a young kid in the 80's, but i have seen bonne bell ads growing up and used to want to use them when i grow up. unfortunately, i grew up and the bonne bell 10.0.6 stuff disappeared... so i was so glad to find them again! i finally put them to the test last week and i have to say i'm hooked. after the first product i bought, i bought three more from their range. love it! 80's for life!